This Coconut Cake recipe is a family favorite. 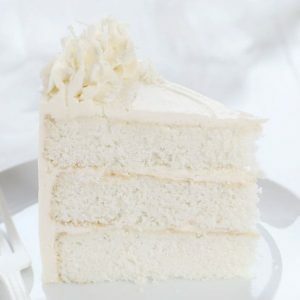 Check out all the ways I infuse coconut flavor into this delicious cake! Preheat oven to 350°F. Prepare three 8-inch round cake pans. Add coconut oil and sugar to stand mixer and beat on medium-high until incorporated about 1-2 minutes. Add coconut extract to the coconut milk. Now, with the mixer on low, add that milk mixture to the sugar mixture in the stand mixer. Sift together flour and baking powder; add to ingredients in stand mixer slowly. Beat at low speed just until incorporated. Turn mixer off. In a separate bowl, beat egg whites at medium speed until stiff peaks form. Remove mixer bowl from stand mixer and gently fold egg whites into batter. Bake at 350°F for 18-25 minutes or until the center does not appear wet and the cake has pulled slightly away from the sides of the pan. Do not overbake!!! Remove cakes from oven and let rest in pan for about 5 minutes. Turn out cakes onto baking rack and level if necessary. Now drizzle each layer with 2-3 tablespoons of simple syrup. You can decorate immediately or chill cakes until ready to assemble.